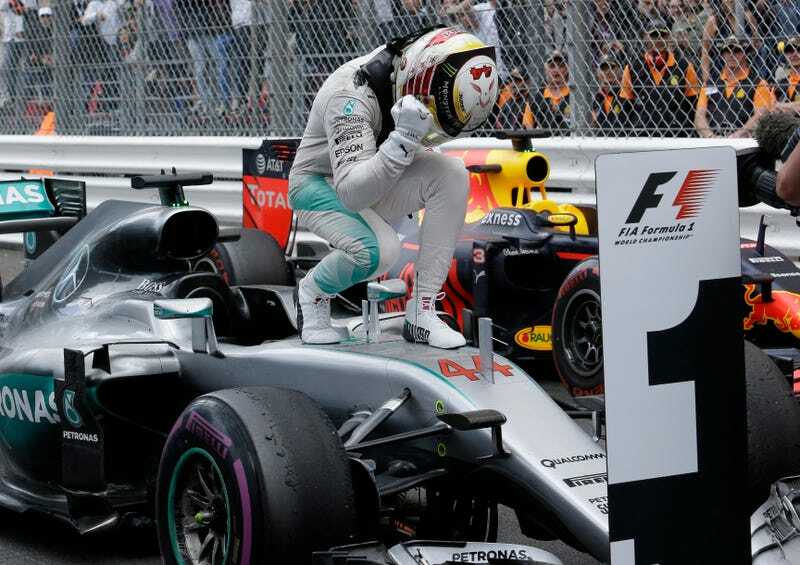 As surprising as it is, Lewis Hamilton’s Monaco Grand Prix win on Sunday was his first in Formula One since clinching the 2015 title at Circuit of The Americas in October. But that wasn’t the main story to come out of the race—rather, it was Red Bull Racing’s royal pit-stop screw up with pole sitter Daniel Ricciardo. Rain plagued parts of the race while other laps ran dry, ranking tire strategy fairly high on the priority list—that is, for the teams that even had tires ready. After leading the first part of the event, Ricciardo lost the top spot to Hamilton for good when he made his way down pit road to meet a crew with no tires. The “miscommunication” cost Ricciardo a full 13.6 seconds, per the F1 race report. For a series with pit stops that average under three seconds, the mistake was a huge one. Tire problems taking Ricciardo out of the top spot—and subsequently handing that spot to a Mercedes driver—isn’t exactly a new thing this season, either. At the Chinese Grand Prix, Nico Rosberg inherited the lead after a debris puncture popped Ricciardo’s tire on lap three. Rain came toward the end of the race, and Ricciardo crossed the line a full seven seconds behind Hamilton. Force India driver Sergio Perez got the third spot on the podium, which had an odd mix of emotions—an elated winner and third-place finisher, and a scowling Ricciardo. If anything, the recent success by Red Bull is something that Ricciardo should be happy about—the victory by 18-year-old Max Verstappen at the Spanish Grand Prix earlier in May was the first for the team since 2014, and Ricciardo’s pole in Monaco was Red Bull’s first since 2013. But in the podium interview, Ricciardo didn’t hesitate to tell everyone how he felt about the race. If Red Bull needs to work on communication skills, it sounds like Ricciardo is off to a good start.